The harp’s pleasing sound works well inside or outdoors (weather permitting). Wedding package includes Prelude, Processional, Recessional, Unity Candle, Postlude and soloist accompaniment or chancel solo, if desired. Go to Music Samples page for suggestions and audio clips. 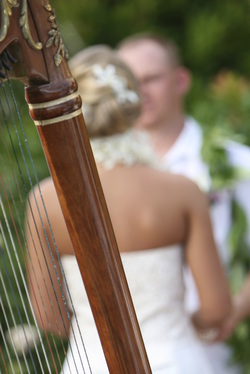 A smaller lever harp is available for rustic or beach settings. I would be honored to provide professional and elegant music for your special day. Requests are welcome!